Monday 2 December marked the night of the Buying Luxury, Acquiring Style – Georgian Menswear event at the British Library, where Patrick Grant and Hannah Greig discussed what it meant to be a fashionable middle-class gentleman in the luxurious era of the late 18th century. After an introduction by Moira Goff, curator of the Georgians Revealed exhibition, the event started with historian and historical adviser Dr Hannah Greig explaining what the term ‘fashion’, at the time called the Beau Monde, implied in the Georgian era: as opposed to what we mean by it today – the production and marketing of new styles of clothing and cosmetics – the term was understood at the time as something more elusive, an element defined mostly by the people that owned the objects, not by the objects themselves. Therefore, the middle class was obsessed with famous people that had that certain je ne sais quoi, that ‘it’ factor which made them stand out. 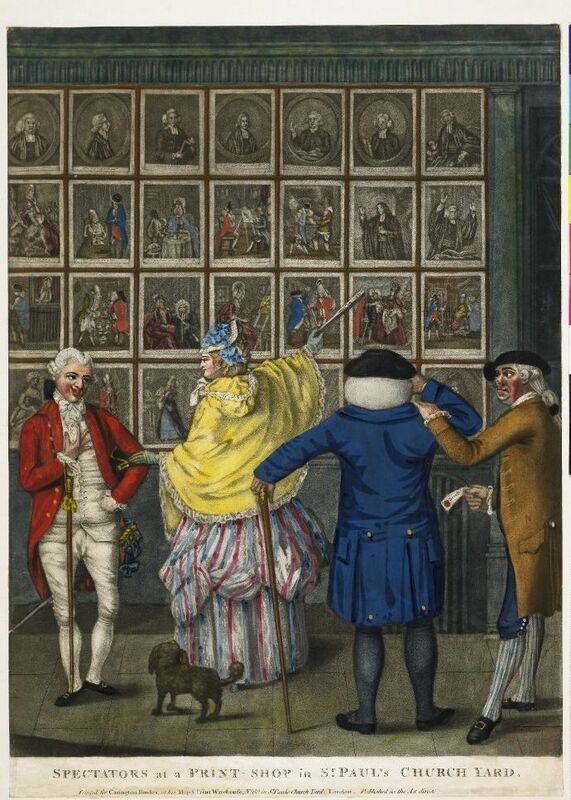 Typical outfits of the time worn by spectators at a print shop. Photo credit: British Library. London became the beating heart of this world, mostly due to politicians being finally required to spend most of their time in the capital. They incorporated the aristocracy and everyone that mattered or wanted to matter, creating a more varied society and amplifying urban life. Just like today, the celebrities of the time were constantly scrutinised by the press and the caricaturists, so a need to display flamboyant and tasteful attire, often inspired by people further up the social ladder or in the European courts, became apparent. 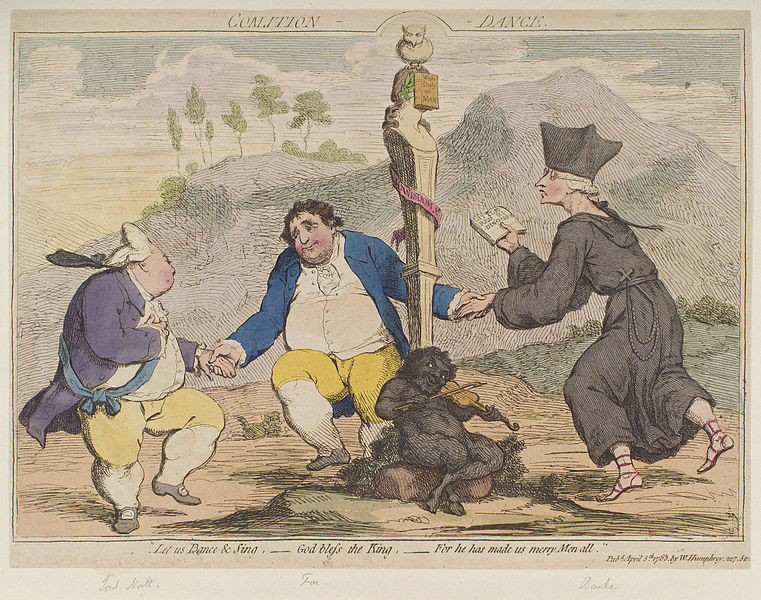 Satire and caricature drawings were very common in the magazines and papers of the time. Photo credit: British Library. Charles James Fox, the charismatic leader of the Whigs, was one of the most fashionable men of his time. Despite his corpulent frame, he started his career wearing a remarkable blue wig and a highly embroidered suit, a style that was eventually emulated by the party’s other members. 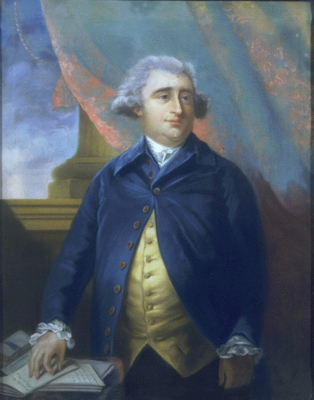 In his later years he cast off the wigs as an act of protest against Pitt’s hair powder tax, and adopted a more sober approach by always wearing what became his signature buff and blue outfits, inspired by the anti monarchist George Washington. Following on from Dr Greig, Patrick Grant – owner of Norton & Sons and E. Tautz and creator of Hammond & Co. for Debenhams – gave us his insight on the subject. He explained to the attendees how a designer might go about creating fashion, be it copying from other designers (!) or borrowing inspiration from the arts and from history, for which the British Library itself is a wonderful resource with diverse and inspiring collections. He brought up as an example how, for the E. Tautz upcoming collection, inspiration was drawn from Samuel Adamson’s Gabriel, a play based in the Restoration period. William Hogarth also played his part in inspiring the collection, along with embroidery created as art therapy and heraldry, yielding very rich silk jacquard on bold patterns, “unfinished” embroidery and blood-red-coloured paints, which dominate the collection. 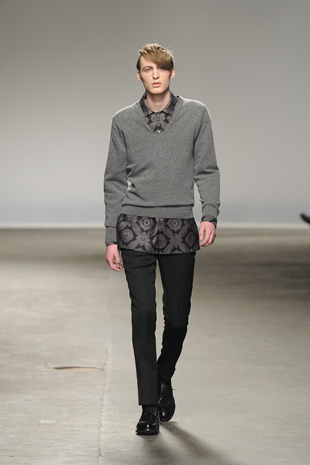 London Menswear collection. Photo credit: Catwalking.com. The concluding discussion between the two speakers showed that they shared views on most points, despite their very different backgrounds. 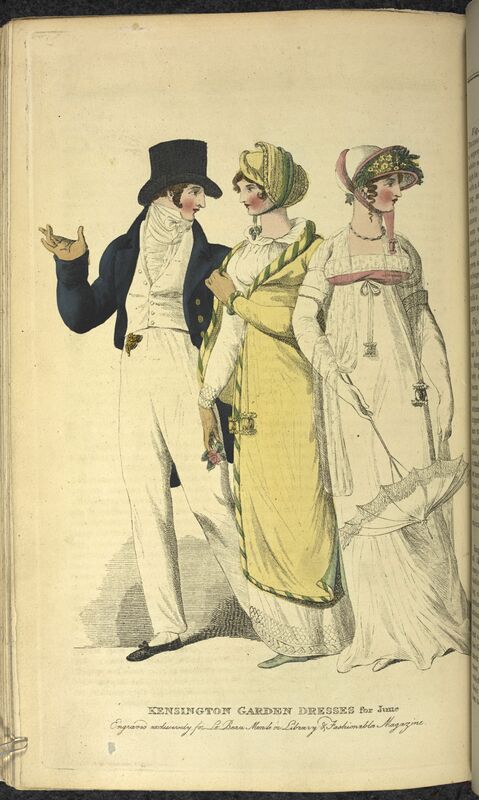 They agreed that in the past, clothes would largely be determined by individuals requesting specific features from their tailors, which meant the trends were mostly dictated by middle-class and aristocracy requests. Today, however, the speakers noted that the designs are mostly a product of the designers’ creativity and panache. They both agreed that fashion and style used to be much more individualistic, whereas today there are no real differences no matter where a garment is created or its cultural background, which means that what people wear in Toronto is pretty much indistinguishable from what they wear in Taiwan or Turin. The main parallelism between the attitude to style two hundred years ago and nowadays is the concept of wanting and buying what the celebrities of the time own(ed), in order to climb the social ladder. Georgian tailors would occasionally even have open-shop days, where they would show the public unfinished dresses they were working on for their famous clients. 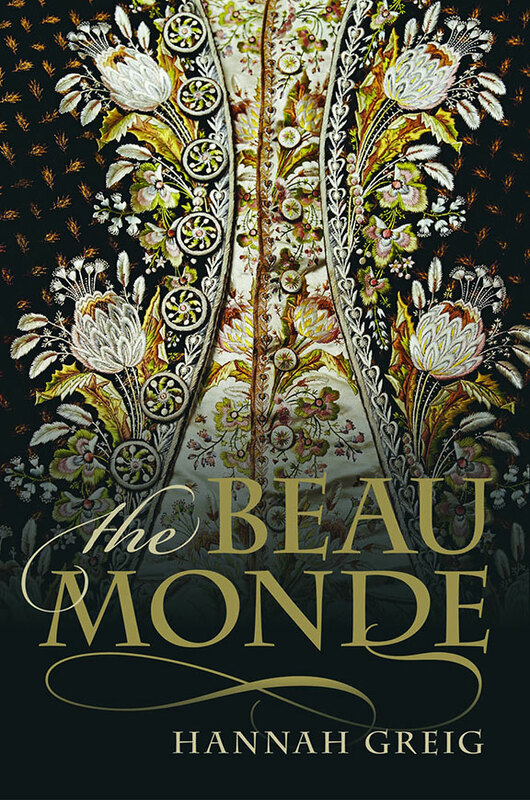 Bourgeoisie wearing examples of the style at the time of the Beau Monde. Photo credit: British Library. Buying Luxury, Acquiring Style was highly instructive and interesting, a peek into a lesser glimpsed world, a time in fashion so highly influential that its effects still resonate today.